Comments: Becoming a Street Performer is as much a calling as it is a choice. It’s as if the Universe has a predetermined plan for those who exhibit the characteristics necessary to pull off this rather untraditional vocation. Those willing to be open to the guidance that the Universe inexplicably provides are the ones who get the most out of this incredible opportunity for a life full of adventure. Sure there can be obstacles in the way, and for Hal Dion ‘weather’ and ‘authority’ were the two occasional barricades that presented themselves. 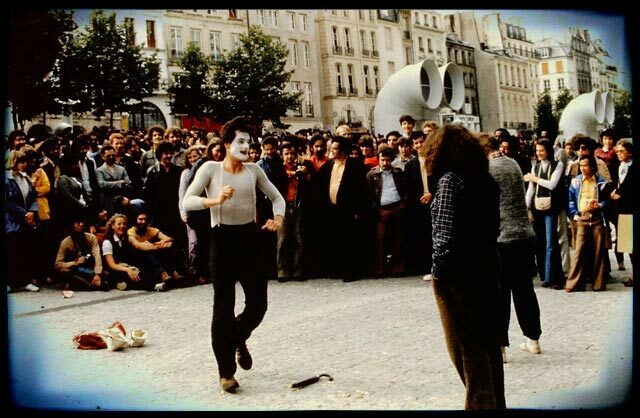 These hurdles end up being inconsequential when compared to the avenues that opened up after he took his love of the eye-candy of body isolations and mime and created a non-verbal show that he took to the streets. Derek McAlister connected with Hal and dialled the clock all the way back to the 70’s to hear about how Hal got his start, the hey-day of playing the steps of the Metropolitan Museum of Art and some of the amazing adventures that Hal enjoyed with his show during his travels performing around the world. 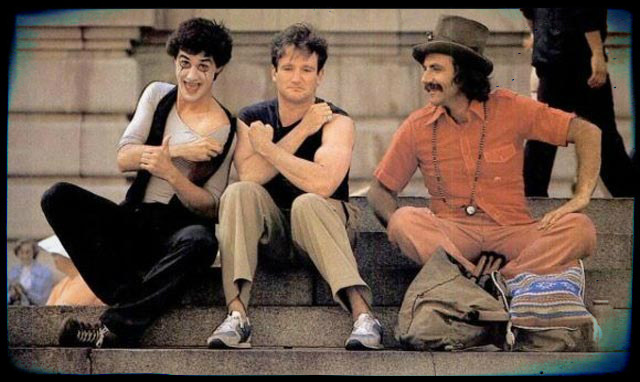 Robin Williams had just finished shooting the feature film, The World According to Garp. Robin was on top of the world and at the top of his game and I was deeply honored on that magical afternoon when he approached and asked me if he could join in and be a part of one of my shows. 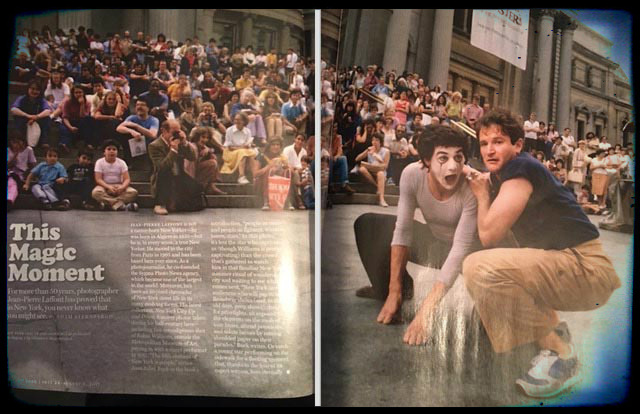 I remember thinking, ‘this is crazy’, then without hesitation I said, “Sure, Robin, let’s go!” It turned out to be a perfect photo-op for New York Magazine. 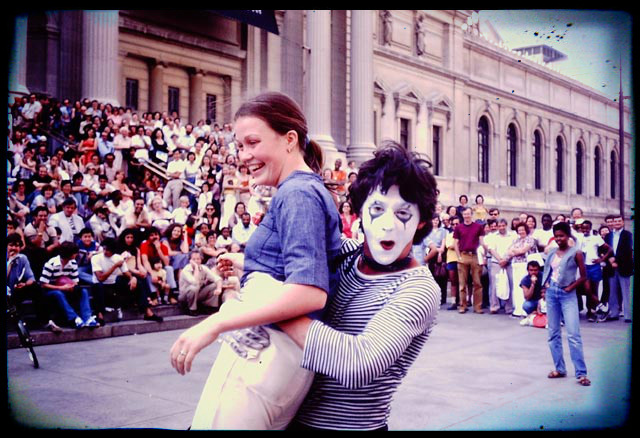 After Robin and I finished that show, we posed for a couple of comical shots on the front steps of the Metropolitan Museum of Art. Fellow street performer, Chuckster the Juggler, joined us for this particular, singular shot! 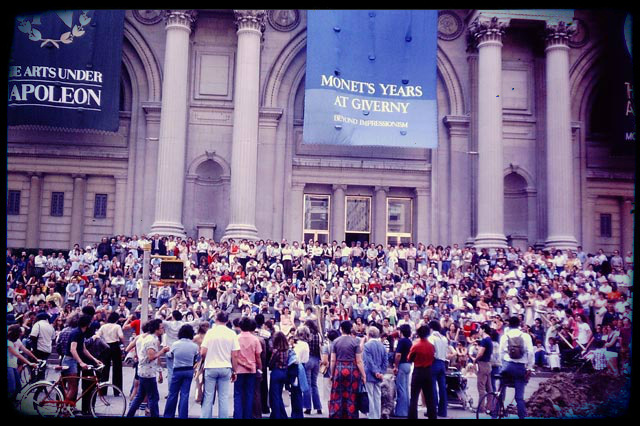 At some point, during every show in front of the Metropolitan Museum of Art, I’d wander off the sidewalk and enter into the slowly passing traffic of 5th Avenue. My aim was to always create some sort of big visual, something that would shock the crowd and hopefully be ‘crowd pleasing’. Looking back, I’m lucky to be alive today. A pure caveman moment: during a show, I’d pick up a gal and try to run off with her. Always done for a simply comic moment and hopefully, a quick laugh. Performing in Paris at the Pompidou. When I first arrived in the City of Light, I was informed that one of the best places to perform was at the Museum of Modern Art. Well, it turns out, everyone performs there. It can be tough to get a spot there and certainly a challenge to gather a crowd, but being persistent always pays off. Thanks for the francs, Monsieur Pompidou. 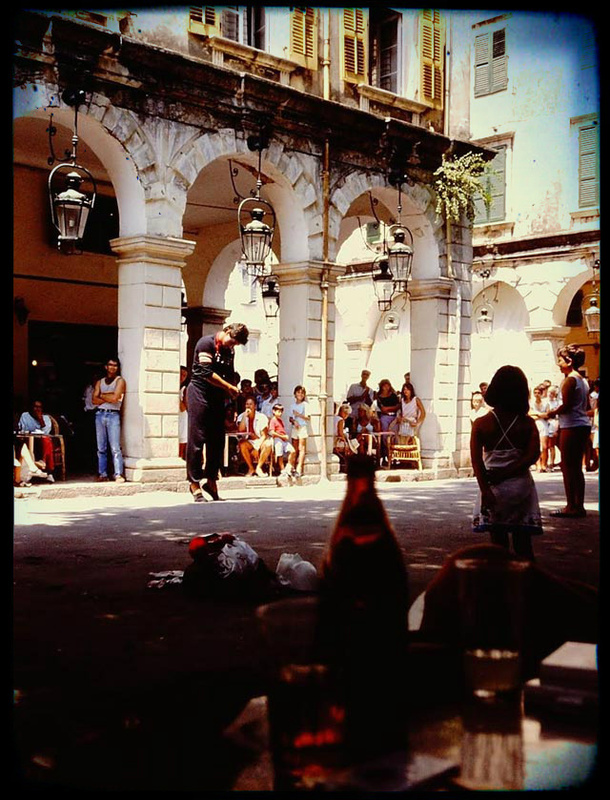 Late morning show at the Liston, Corfu, Greece. Hands down, this beautiful esplanade and social cafe spot has always been my favorite and most special place to perform in the world. Can’t wait to return! 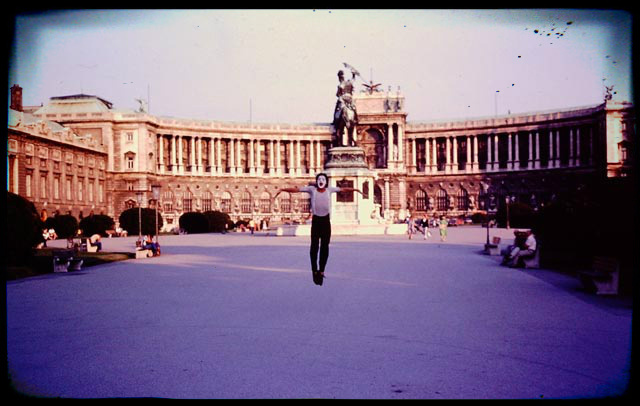 After a great street show in Vienna, I was compelled to take this joyous leap. Celebrate the show, celebrate the day, celebrate the gift of being a busker! 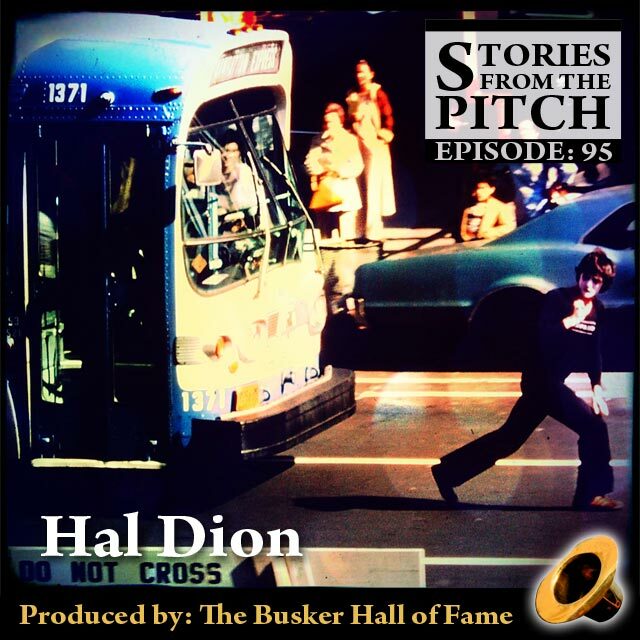 This entry was posted in Bio-Episode, Derek McAlister, Interview, Street Performing. Bookmark the permalink. Wonderful interview Hal, you have really experienced some wonder things in life doing what you love! Wish you all the best, keep smiling and enjoying life! 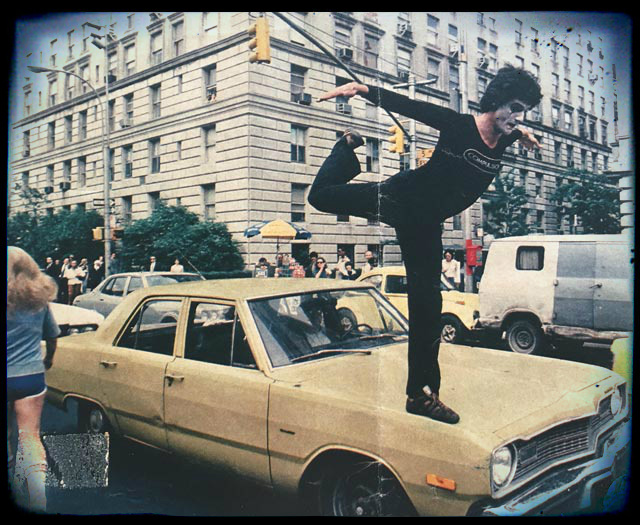 I was very impressed with your ballet position on the bonnet of a car in New York!